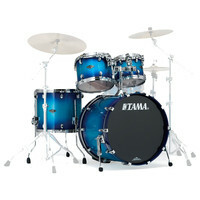 The Tama Starclassic Performer kit is a 4 piece set containing two rack toms a floor tom and a 22 bass drum. Included Quick Lock tom brackets provide a fast and consistently secure fit for the toms. The twilight blue burst finish also includes a redesigned badge transfer logo in addition to other features such as Star-Cast mounting system cushioned floor tom legs and Evans® heads. The Starclassic Performer kit utilises a unique construction by using bubinga wood for the inner plies of a birch shell. This combination of construction materials provides a new sound featuring the focused attack of birch and the enhanced lows of bubinga. This entry was posted in Tama and tagged Drums-and-Percussion. Bookmark the permalink.